Do you like saving money with discount pet supplies, online deals, and pet coupons? I know I sure do! I love being able to find great online deals for my pets whenever possible because it allows me to try new products I might not have tried otherwise. This post is sponsored by Slickdeals. I am being compensated to help spread the word about Slickdeals and the #SlickdealsPets Twitter Party, but Pawsitively Pets only shares information we feel is relevant to our readers. Slickdeals is not responsible for the content of this article. 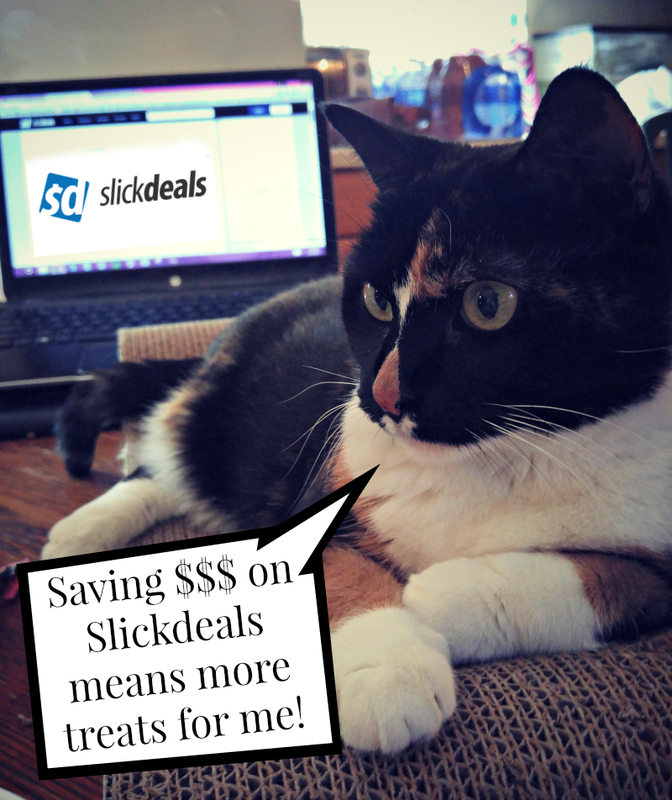 If you are into pet coupons and online deals like I am (or saving money on anything in general), I would like to introduce you to Slickdeals. 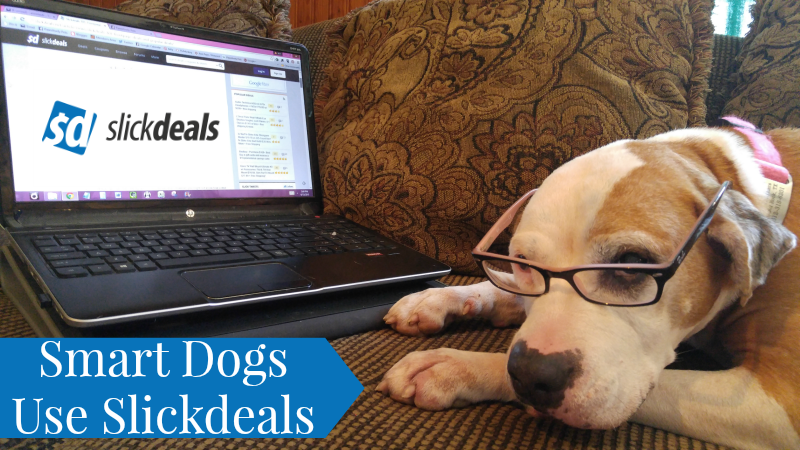 Slickdeals is a website that offers ways to save money on everyday items for your pets. You can find them online or download the Slickdeals Mobile App, which is available for iPhones. It's an easy way to save money while you're out and about. Next month, we'll be celebrating Adopt a Shelter Dog Month by co-hosting a #SlickdealsPets Twitter Party and this is a great time to learn how Slickdeals can help you save money on a newly adopted fur friend! Or if you like to donate items to your local shelter, Slickdeals can help with that too. More savings means more items that you might be able to donate. How can you get started? First of all, you'll need to visit the Slickdeals website. When you visit Slickdeals, you'll see a number of "Frontpage Deals". These online deals can be for just about anything you can imagine. Click here to see an explanation of how the Frontpage Deals at Slickdeals works. Those are just a few that caught my eye, personally. In addition to discount pet supplies, you can also find some coupons, coupon codes, and giveaways at Slickdeals. When I searched for pet coupons, I found several for Only Natural Pet, Petco, PetSmart, and more. When: Thursday, October 1st, 2015 at 8PM ET/ 5PM PT - mark your calendars! 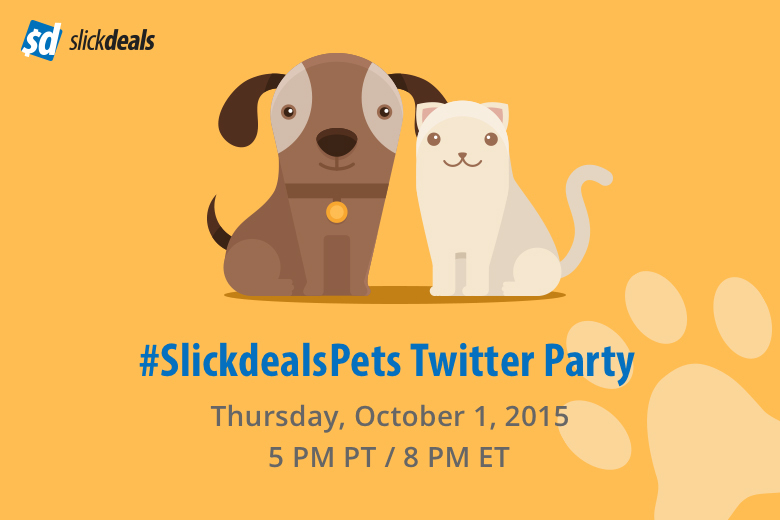 Hashtag: #SlickdealsPets - use this tweet to join the chat! Prizes: (1) $25 Amazon gift card, (1) $50 Petco gift card, (1) $50 PetSmart gift card, and (1) $100 Amazon gift card. All prizes provided by Slickdeals. You can follow your hosts on Twitter @Slickdeals, @BeaglesBargains, and @mypawsitivepet. We can't wait to see you there for fun, prizes, and saving money with Slickdeals! Saving money is a great way to get more treats in the long run! Now that's what I call a 'slick deal'!...get it? Slick Deals is a great place to get some good bargains! I haven't used them for quite some time ... gotta check them out again. Thanks for the reminder! Callie looks like she found some great deals! I bet Shiner had her eye on all the food and treat deals!